Val: Why did you do it Ray? Ray: I did it because I love you. Nil By Mouth deals with subjects that are often kept outside the lines of Hollywood interests: abuse, across a wide spectrum of areas including domestic, drug, and alcohol, and most frighteningly what occurs when the three are combined. It is a film of unflinching brutality, directed by actor Gary Oldman, who based the events on his own youth in South London. Whether or not the events that transpire in his film happened verbatim in real life is known only by Oldman, but there is no denying that, thanks to his writing and direction, the situations feel as uncomfortably real as they possibly could. The film centers around a group of individuals who share a low-rent apartment in London and the effects that poverty and other factors have on their lives. There is Ray (Winstone), whose frequent trips to the pub have become a burden on his pregnant wife, Val (Burke), whom Ray loves but also victimizes with savage beatings when he arrives home. As if this were not enough, there is Billy (Charlie Creed-Miles), living with Val and Ray, whose habitual drug habit also causes rifts. Soon, Billy is thrown out of the apartment bloodied and beaten by Ray after money goes missing. This is only a small portion of the events that occur along the downward spiral of events that transpire in Nil By Mouth, but this is not to say that the film is violent and brutal for its entire length. There are occasional moments of humor dispersed throughout and there is a particularly touching and heartbreaking scene as Ray delivers a monologue about his father, and the lack of love shown to him when Ray was a child. It is a moment of ironic agony, but the way in which Oldman wrote it and Winstone performs it makes it just as deeply affecting as the violence. Anyone with a working knowledge of film knows the abilities of actor Gary Oldman; his body of work is truly an impressive one. As a director, Oldman shows equal talent, as his work here shows a truly unique style and a vast knowledge of filmmaking. In one critical and violent scene, Oldman lets the camera drift away and out of the frame, but we still hear the screams and the uneasy sounds of the victim's suffering. It is an unsettling, to be sure, and Oldman's work makes it even more so as he leaves it up to the viewer to imagine the horrors occurring, rather than going for the cheap effect that might lessen the emotional impact. The performances are simply outstanding from top to bottom, including one that is never seen, but heard. The score by Eric Clapton, which is bluesy and seductive, blends perfectly into the scenes so that it heightens the utter desperation depicted. It is hard to imagine better work than the performance of Ray Winstone, who gives a fierce and forceful performance, controlling every scene. But he is matched evenly by Burke, who won the Best Actress award at Cannes. Their performances are perfectly nuanced, and it is to their credit that even at their lowest points (specifically Ray), we still feel for these characters despite their actions and situations. Nil By Mouth is a fascinating but brutal film that may prove difficult to watch for some, given the graphic domestic violence. However, the performances and Oldman's flawless direction make this, simply, terrific cinema. Image Transfer Review: Presented in 1.85:1 anamorphic widescreen format, Nil By Mouth retains the murky and grainy look present in its original theatrical release and the transfer recreates the look quite well. Sharpness and detail are not as good as one may hope, but given the intentional grain in the print, I doubt stellar details would come across. Blacks are nicely done, while colors are effectively murky. Audio Transfer Review: The Dolby Surround track is based almost entirely in the center channel, but is is done nicely with no distortion and nice depth. Surrounds are used very sparingly, with only music and slight ambient sounds coming across. 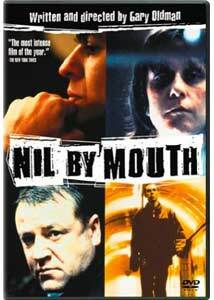 Extras Review: Trailers for Nil By Mouth, Once Upon a Time in the Midlands, Last Orders, and Mute Witness are offered. Based on Oldman's account of his youth in South London, Nil By Mouth is a film of staggering power in nearly every aspect. From its flawless performances to the direction of Gary Oldman (who seems to have made peace with his own personal demons), it is one of the best works of cinema from the past decade. It stands along with Tim Roth's The War Zone and Mike Leigh's All or Nothing, films that effectively portray the dire situations of those in or around working-class London. Highly Recommended.